Ryan and Deb, friends of Matt, came to visit us in November for roughly two weeks. We had a grand ol' time together, drinking and eating (in that order) like good little porky Romans. The more unusual or specific to the region the food was the better, as far as I was concerned. Granted, there were some things that were "off the table," (harharhar) like peacock tongues, which wealthy ancient Romans actually ate. First stop was at the Ca Bruzzo winery in the Berici hills (where once before drove down a hiking trail). This was one of the highlights of the trip. We got lost trying to find the place (no surprise there). We ended up driving down several different driveways and a road that looked suspiciously like another hiking trail. We arrived before dark though, so we had some time to walk through the vineyards at sunset. Then we headed to the cellar to drink progressively older and finer wines and pretend we were actually absorbing information. The winery is operated by a family from California who had extended family (ie, tour guide's grandmother) in Italy. They specialize in small patches of wine, using innovative techniques. This is a family-run, organic winery- no pesticides, no fertilizer, no irrigation. French oak barrels, unusual grafting techniques, and region specific climate make for some delicious wines! 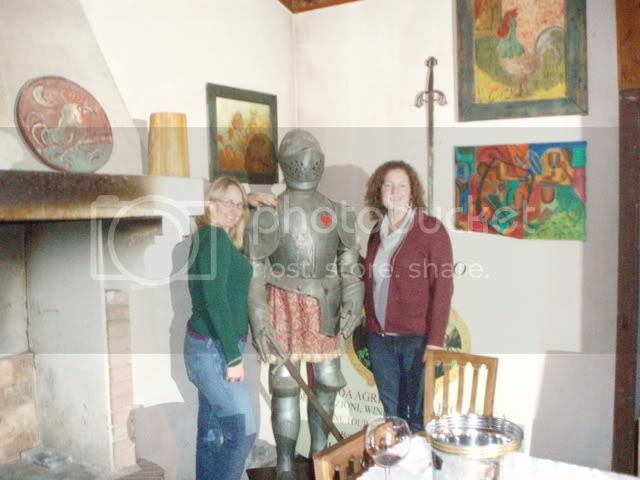 After the wine lesson, we were welcomed into their entertainment room to enjoy cheese, bread, more wine, and talk about Lord of the Rings next to a huge hearth and a suit of armor. The conversation and laughing was ceaseless until MOM came in and busted up the party. We reluctantly left with numerous bottles of wine after drawn out conversations in the driveway. We'll have to go together when you come to visit. The wines are about 15 euro each. If you find them in the states (unlikely) you'll pay about $45. Naples - finding enjoyment in a REAL ghetto.